My wife, Kathleen, and I hiked a portion of the John Muir Trail in the summer of 2007. I am a huge fan of hiking with your spouse, but that’s not what this post is about. Instead, I’d like to describe one of the many memorable experiences we had on the trail. It was June 22nd at about 9:30 in the morning. We had camped at the southern end of Lyell Canyon the night before, and had just reached the top of Donohue Pass. We shed our backpacks and were resting our weary legs when we saw a group of hikers coming from the opposite direction. There were three: two men, who appeared to be in their mid-thirties, and a young boy we would later learn was twelve-years-old. I’m afraid neither of us can recall the young man’s trail name. I seem to remember it was a synonym for “rascal”, while Kathleen thinks it was a synonym for “impatient”. In the fifteen minutes we spent with him, either would have fit. As we talked to the group, the young, impatient, rascal was almost vibrating in place—about to burst with some inner energy. He wore on his face this look of anticipation, seemingly hanging on every word, waiting for us to finally get around to asking the magic question. One of the older men mentioned stopping in Tuolumne Meadow for cheeseburgers, and then pressing on. Neither of us will ever forget him. His enthusiasm was infectious, his confidence high, and his pack rode lightly on his shoulders. And this wasn’t merely beginning-of-the-trip excitement. Donohue Pass is almost halfway through the state of California; it’s a long, long way from the Mexican border near Campo, where they had begun months earlier. To this day we wonder if he made it all the way. We hope so, but, regardless, we’re sure he stepped off the trail a different kid than the one who stepped on it. If our young rascal had been a company, I would have bought stock in him on that very day. 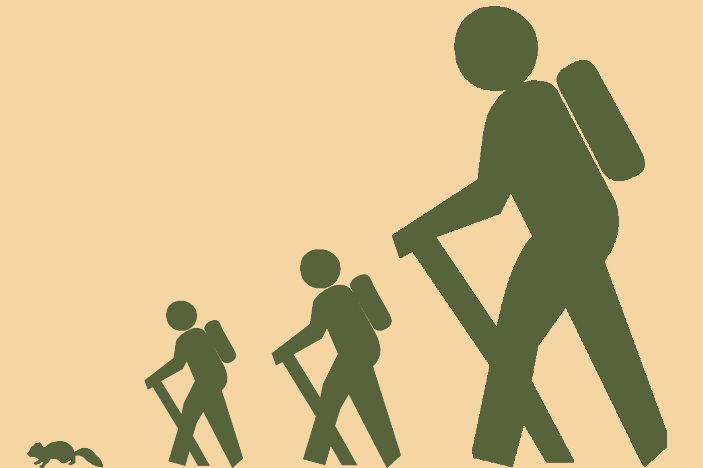 Unfortunately, far too few kids get the experience of long distance hiking. While planning an assault on the PCT—and getting the time off to do it—is practically impossible for most people, I can think of no better alternative than the John Muir Trial. At a little more than 200 miles it is just about the perfect distance: long enough to seem impossible for young hikers, and short enough to be doable. The weather is usually benign in July, August and September. The fauna is as benign as the weather. There are mountain lions, but there are no recorded mountain lion attacks against people on the trail, and the bears are more interested in your trial mix than you. A grizzly bear hasn’t roamed the Sierra Nevada for nearly one hundred years. If you are foolish enough to hike early in the season the mosquitoes may exsanguinate you, but even that is avoidable with a little repellent. There are few, if any, navigational challenges, and the trail is generally uncrowded—without being totally deserted. In short, you are unlikely to get yourself in trouble, and if you do, someone will probably come along to help out. Consider giving this gift to your son, daughter, grandson or granddaughter. My wife and I are taking our kids next year, they will be 15 and 12 when we go, I cannot wait. I hiked it solo last year, but next will be great because I will be able to share the experience with my family. Thanks for the post. Congratulations, Justice, on planning such a great adventure. Although the “three rules” I discuss here (http://jmtbook.com/john-muir-trail-hiking-the-trail-with-your-spouse/) apply to hiking with your spouse, they could also apply to hiking with children, especially ones the age of yours. Good luck! Good for them, I have a 1 1/2 year old boy, and while not of hiking age yet, he has a few camping trips under his belt already. Looking forward to when he grows up to start doing some short trips. Weaver Lake is a great place to take young kids starting out, only a few miles but plenty of up and down and to a kid they may as well have hiked the whole JMT. Thanks for the comment, Dan. I’ve often said that one of the greatest turning points in any young person’s life is when he or she accomplishes something they were sure they couldn’t do. Hiking is a perfect way to achieve just that. For those readers wondering where Weaver Lake is, check out here: http://goo.gl/maps/prnJB. Planning for summer of 2014 with my 11year old. Have been on PCT but for 3 days only. She has greater stamina than me. Looking forward to our hike. I took my 14 and 11 yr olds last year. They did great and want to do it again next year. Thanks for the comment, Tom, and congratulations to you and your children! Thanks, Heather. You may want to check out this [http://www.whiteblaze.net/forum/archive/index.php/t-63399.html] as well. Good for them, I did the JMT when I was 13 and started 25 miles south of mount Whitney.it was very hard but also very fun. Then right after it we climbed half dome. I can’t say for sure, but the boy may have been Oblivious with his father Troll. They did the PCT in 2007, after having done the AT in 2005. Thanks! You may be right; I checked their trail journal and the timing is about right. Looks like they made it!